Capital Murder suspect Eulalio De Los Santos Monjaras. McALLEN — Two men living in the country without legal status pleaded guilty to federal gun charges Wednesday. Jorge Carlos Lopez-Marquez, 38, and Eulalio Monjaras-De Los Santos, 39, stood before U.S. District Judge Micaela Alvarez during a final pre-trial hearing Wednesday, when the two Mexican Nationals took responsibility for being in the country illegally and being in possession of a firearm. Authorities arrested Lopez-Marquez on Feb. 27 in connection with the purchase of a Taurus .38-caliber revolver that was tied to the August shooting death of a 19-year-old Mission man named Cesar Eduardo Jaramillo Esquivel. Monjaras was arrested last October, two months after authorities began looking for Monjaras in connection with Jaramillo’s death. On Aug. 22, 2017, Jaramillo was found dead with a gunshot wound to his head at a rural Mission residence. 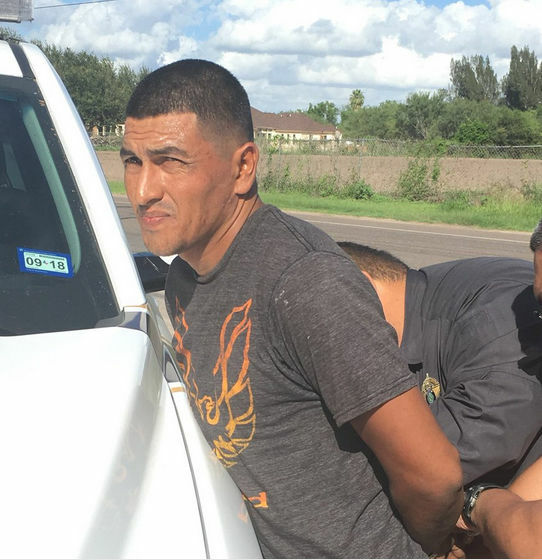 Authorities said they believe the motive for the shooting was an argument between former business partners Monjaras and Jaramillo, and it is believed that Monjaras owed Jaramillo money, according to the Hidalgo County Sheriff’s Office. According to witness statements and video surveillance gathered by authorities, the 19-year-old Mission man visited Monjaras’ place of business, where Jaramillo was “taken against his will, and later killed.” His body was found at a rural Mission residence. Shortly after Monjaras was arrested, Lopez-Marquez told sheriff’s deputies that he purchased a revolver for $30 from a man later identified as Monjaras, the complaint states. “Lopez-Marquez stated he later learned the revolver was involved in a murder and provided the firearm to another individual to sell the revolver,” the complaint states. One day later, Lopez-Marquez was able to retrieve the revolver from the person he had sold it to and handed it over to sheriff’s deputies. Monjaras, who faces a capital murder charge in Hidalgo County State District Court related to Jaramillo’s shooting death, is due back in front of Judge Israel Ramon on May 14, court records show. Both men will remain in custody pending their sentencing hearing, which is set for July 18. Lopez-Marquez will be deported upon completion of his prison sentence.